People like to poke fun at Florida, but over the past month, the most impressive political movement ever put forth by a group of high school students has come straight out of Broward County. After the tragic February 14 shooting at Parkland’s Marjory Stoneman Douglas High School that killed 17 people, students mobilized first to protest in Tallahassee, then organized a nationwide 17-minute school walkout March 14, and now have planned the largest gun-related protest in history on March 24 in Washington, DC. For the unfamiliar, March for Our Lives will see thousands of people descend on Washington, DC., rallying for school safety and stricter gun laws. The movement has garnered millions of dollars in donations and celebrity support, ranging from Oprah and George Clooney to Steven Spielberg. Celebs marching in DC will include Ariana Grande, Jennifer Hudson, Miley Cyrus, and Demi Lovato. It’s sparked sibling marches all over the world, from Tel Aviv to Paris to Hong Kong, and, of course, here in South Florida. Though sadly, school shootings aren’t a new phenomenon in America, for some reason the Parkland shooting has created a formidable force. And as this tragedy hits harder in South Florida than other places, the marches here will be filled with more emotion, survivors, and inspirational stories than anywhere else. Getting to DC might not be possible for some who want their voices heard, but you can still get your message out at plenty of marches throughout the region. Though the largest march will be in Miami Beach, whether you live in Dade, Broward, Palm Beach, or the Keys, there will be a March for Our Lives somewhere close, so you too can join the rallying cry of #neveragain. And while you're at it, use the #MarchForOurLives hashtag on your social networks to keep the momentum moving. We've listed out all the major marches happening in Dade County, Broward County, Palm Beach County, and the Keys. Here’s a quick rundown of all them with detailed information available. What's the march route? : Marchers will go from Miami Beach Senior High to Collins Park, where a rally will start at 10:45am that includes speeches from survivors and family members from the Marjory Stoneman Douglas shooting. The march will return to Bach High at noon. How can I get there? : Lyft will be offering a limited number of free rides to the march, though city officials are suggesting public transportation, as public lots will fill up quickly. It’s the Beach, you know the parking drill. What's the march route? : No route has been specified by organizers, but they will be “taking to the streets,” according to the march’s page on Marchforourlives.com. Expect to leave the park and wear comfortable shoes. What's the march route? : The route will go around two miles through North Lauderdale. So bring comfortable shoes. What's the march route? : Marchers will go down Atlantic Boulevard to Pompano Beach, where a rally will be help open to anyone who feels they have something to say. How can I get there? : Special trolleys will run to the event, which will also include a sign-making party. You can check the March For Our Lives website for further information for marches in Miami Lakes, Fort Lauderdale, Weston, and other cities as it becomes available -- or for more details on these marches. Remember to pack plenty of water (it’s hot out there, folks) and sunscreen if you’re not looking to work on your tan while you get your social action on. And remember it’s a march -- wear comfortable walking shoes and exercise appropriate clothes, and please behave with the respect the event deserves. 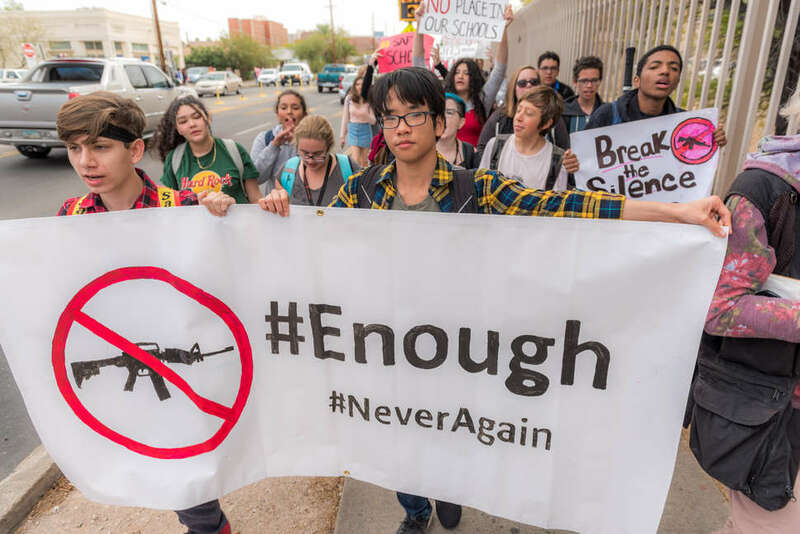 No matter where one falls on this issue, or whether you care to march or not, one can’t help but be impressed with all these kids from South Florida have accomplished. If nothing else, it gives us great hope for the next generation of Florida Man. Editor's note: If you're travelling to other cities or have friends who want to get involved in the marches, check out our guides for NYC, Washington D.C., San Francisco, Los Angeles, and Chicago.